Payson (population 1,066) is located in far-western Illinois about eight miles southeast of Quincy. The town was platted in the southwestern portion of Adams County. Illinois Route 96 is the main roadway to and from Payson. The Fall Creek flows through the center and north side of town while the Pigeon Creek flows through the south side of town. The Mississippi River is located just four miles west of Payson. The history of the town and its years of solo high school service are in need of research. We know that a high school was probably established in Payson by the late 1800s or early1900s. Payson High School served the community for many years and continues to do so today. In 1916 a family named Seymour erected a school in town in honor of a boy named Charles Seymour, who was killed at the age of 16 in an accident while playing baseball. A ball struck him in the chest and he died. We believe that Payson High School and Seymour High School co-existed in Payson for several years before the two schools eventually merged together,. This merger probably took place in the late 1940s. Payson High School is recognized differently from Payson Seymour High School on the IHSA websitre (www.ihsa.org). "I believe the school was built and it served as the high school, as a lot of small towns served still today by the district had grade schools. Later (50's or so) a High school was built across the street as Seymour High School. 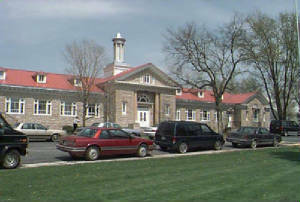 The old school was renamed Seymour Grade school at that time. Payson High was there before the Seymour family built theirs, and some structural stuff existed during completion, including the gym. This will explain the different names. There is actually a large trophy cabinet in the grade school containing all high school athletic trophies from the old days, and another few in the "new" school." The fate of the original Payson High School building is being sought. 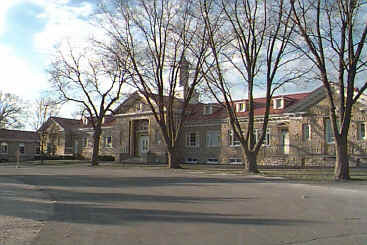 The Seymour building built in 1916 is utilized today as a grade school for the Payson Seymour School District. For more reading about the history of Payson check out the web address of http://history.rays-place.com/il/adams-payson.htm . We know that Payson High School competed in basketball and track. Basseball was probably also offered. Team nickname, colors, fight song, coach's names, and team records are all items we're looking for. The Payson High School boys basketball team won one DIstrtict title during their existence. This is currently all of the information we have available on the basketball program at PHS. One Payson High School lad brought home an individual medal from the IHSA State Track Meet. A trackster named Bower (first name not listed) placed second in the Javelin throw in 1929!! 1928-29 ?? Bower Javelin 2ND Place! If you have further information you would like to share regariding the original Payson High School and its athletic prowess, please complete the school submission or the guest commentary forms. We are also seeking a photo of the high school building to add to the site.